Moments with the Mays: THE pout. Well folks, I feel like we have officially reached Toddlerhood. Toddlerhood is a little bit different than Babyhood. Babies may get upset when something is taken away, but usually they are easily distracted. Toddlerhood is a whole new ball game. A ball game full of arched backs, screaming, hitting, tantr﻿ums, and THE pout. Long gone are the days of easy distractions to prevent a meltdown. Instead we get the full-blown, head-flinging, body-to-the-ground tantrums over ridiculous things. For example, we spend our mornings playing in the bonus room upstairs. G roams happily amongst his gazillion toys and I try and drink my coffee before it's cold. Well, my toddler thinks it is totally acceptable to drink coffee. The other morning when I wouldn't let him hold my mug and drink the whole dang cup, he fell to his bottom, flung his head back on purpose, and slammed into his metal xylophone. All over a cup of coffee. I mean, seriously. 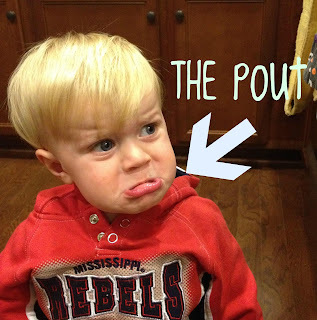 These days we are also dealing with THE pout. Not just any pout, folks. I'm talking the most over-dramatic pout you have ever seen. ﻿Ben says Grayson gets his pout from me. Sadly, I can't take credit for that. THE pout is definitely from his daddy & I'm pretty sure Taylor from the RHOBH paid big bucks to make her pout look like that. 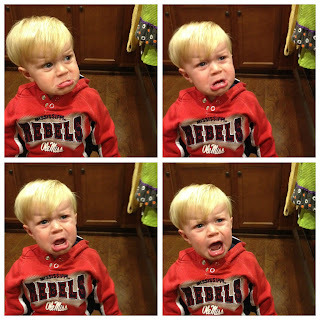 Just for fun, here is what happens in our house when we tell a certain someone "no." 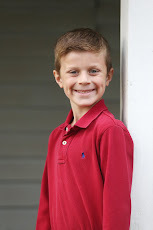 And yes, we are those parents that capture these kind of moments. Don't judge. 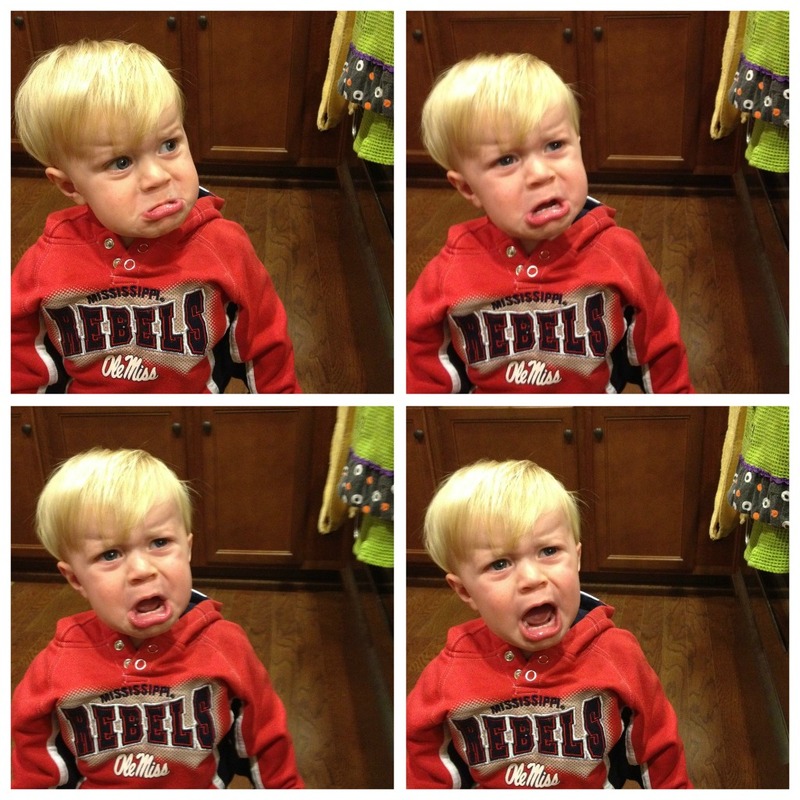 I seriously can't get over the emotion on this boy's face...his tantrums are serious business. ﻿On that note, welcome to Toddlerhood. We've got a pouter too and I'm pretty sure Mason and Grayson could be twins when they pout. Ha!! I'm dying... I need to capture some of Carsyn's hissy fits.. I hate the arched back and head flinging! Give that boy some coffee!! How about if you make him a latte so he will drink milk?!? We too have been introduced to Toddlerhood. And its just not the same as babyhood. If we out Chloe down to walk when we are holding her, she will arch her back, which makes us have to grab her or else she will fall straight back on her head. She is just so overly dramatic about everything. Fun times!! I miss my baby!!! His pout is precious! While time in the trenches of toddlerhood must be tough, you'll love having these pictures to look back on later. :) Hope you had a great weekend! This is the funniest post ever! I love it! Even with his pout, he's precious!